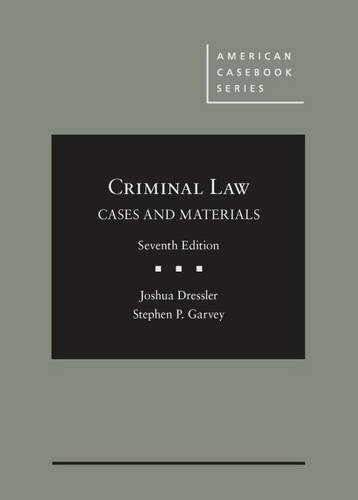 1628102055 -This popular casebook, through the selection of classic and modern cases, provides an excellent tool for teaching students the common law foundations of the criminal law and modern statutory reform, including the Model Penal Code. Along the way, the casebook considers modern controversies (e.g., “shaming” punishment, capital punishment, broadening sexual assault law, self-defense by battered women, euthanasia, the role of culture in determining culpability), and creatively uses literature (e.g., examining insanity through Edgar Allen Poe’s The-Tell Tale Heart) and even “brain teasers” to confront (as the Preface states) “the Big Questions . . . that philosophers, theologians, scientists, and poets, as well as lawyers, have grappled with for centuries.” The Seventh Edition, as in the past, includes new cases, as well as updates in the notes that bring current issues of criminal law to the fore. New Power Points have been added to the casebook companion website.